After an introduction covering landscape, baronies, parishes and various leisure and cultural attractions, it is followed by chapters dealing with eight tours of the county, with an outline history of each town, museum and heritage centre on route, and placing archaeological and historical sites in their historical context. The Ballinrobe launch of Bernard O’Hara’s new book, Exploring Mayo, will take place in the library on Thursday 23 November at 8pm. All are welcome. The launch will be performed by Ms Averil Staunton, author of Harry Clarke’s Liquid Light: Stained–Glass Windows of St Mary’s Church Ballinrobe, and other local publications. 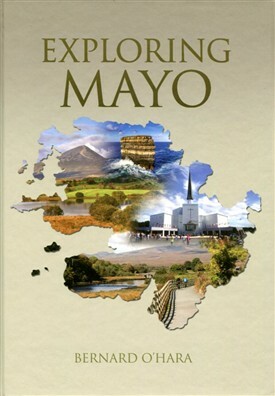 After an introduction covering landscape, baronies, parishes and various leisure and cultural attractions, Exploring Mayo has a chapter on the archaeological and historical heritage of the county. This is followed by chapters dealing with eight tours of the county, with an outline history of each town, museum and heritage centre on route, and placing archaeological and historical sites in their historical context as well as architecture, public art, wildlife, and various other aspects of its inheritance. In addition, many daughters and sons are profiled. This lavishly illustrated book, with an excellent Ordnance Survey map of the county, provides a wonderful appreciation of County Mayo’s rich heritage and a guide to the attractions of its various regions. It has been described by people who read the final draft as “wonderful”, “terrific” and “stunning”. It is published by Killasser/Callow Heritage Society in hardback only and sells for €20. Bernard O’Hara, a native of Killasser, is resident in Salthill, Galway. He is a former lecturer, Head of School, and Registrar at Galway-Mayo Institute of Technology. His previous publications include some relating to the history and heritage of County Mayo, such as Mayo: Aspects of its Heritage (ed. ), The Archaeological Heritage of Killasser, Co. Mayo, Davitt, and Killasser: Heritage of a Mayo Parish. Other publications include books on entrepreneurship, education and industrial relations. He is a former President and long term committee member of the Galway Archaeological and Historical Society. This page was added by Averil Staunton on 23/11/2017.